SNY brings loaded auto racks from Delanson to the park. 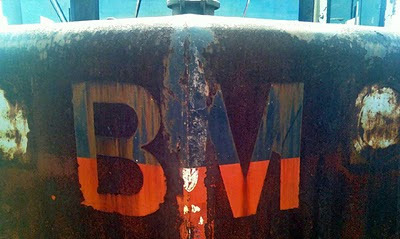 I had time to snap this pic, the B&M will never die in our hearts. 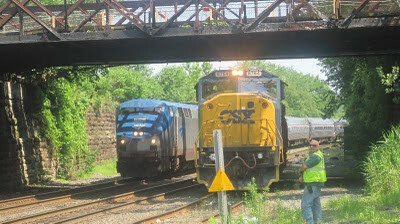 Wayne Sittner sent a few from his travels, local CSX as Amtrak passes. As long as I can remember there's been discussion about the well being of the hobby of model railroading. The anxiety of "Are we getting young people into the hobby?" As you might be able to tell from my enthusiasm, this is one of the best photographed and modeled scenes I've ever witnessed. "The attached a photo I am working on for RMC. 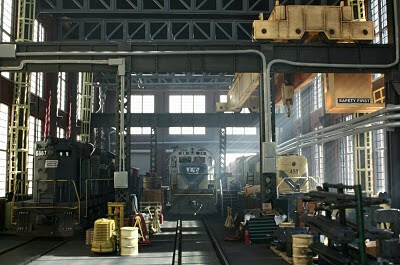 This shot is inside the enginehouse I built. I am working at getting the lighting just right. The engines are Lackawanna Terminal power which is my friend Steve's railroad. I am getting him into the transitional scheme. I am building power for his road that is just quick stencil jobs. Hence the L&HR patch job as well as the PC geep on the left. I really like the feel of the lighting here. 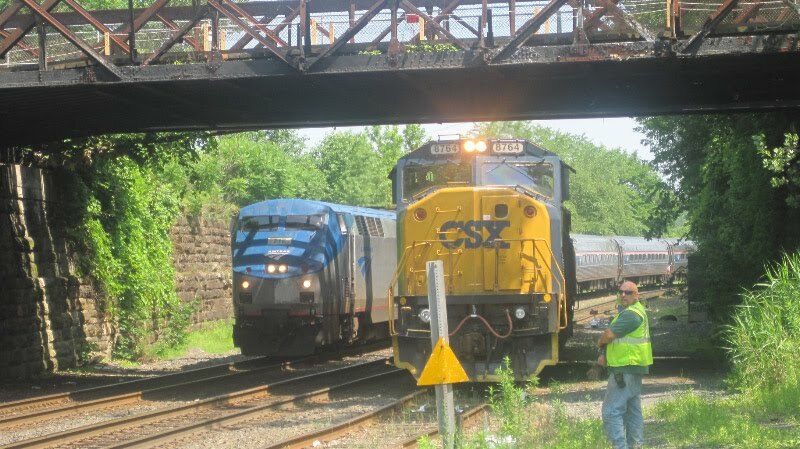 Last week CP ran an OCS over the D&H, Paying visits to Binghamton, Albany and Rouses Point. 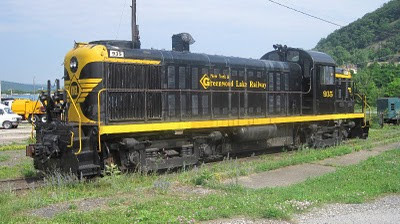 CP’s VP and COO along with other officials were reported to be riding the train which Consisted of two Geeps and borrowed Vermont Rail Systems, vintage observation car “Macintyre”. Once arriving in Albany at Kenwood Yard the Macintyre had to be turned so the observation end would face the opposite way for the run north to Rouses Point from Albany, necessitating a deadhead run to the “Magic Triangle” a term coined by fellow Railfan Bill Kozel which is the trackage between CPF 478, CPC 24 and CPF 480 which when joined together at there respective control points form an “Unofficial Wye”. 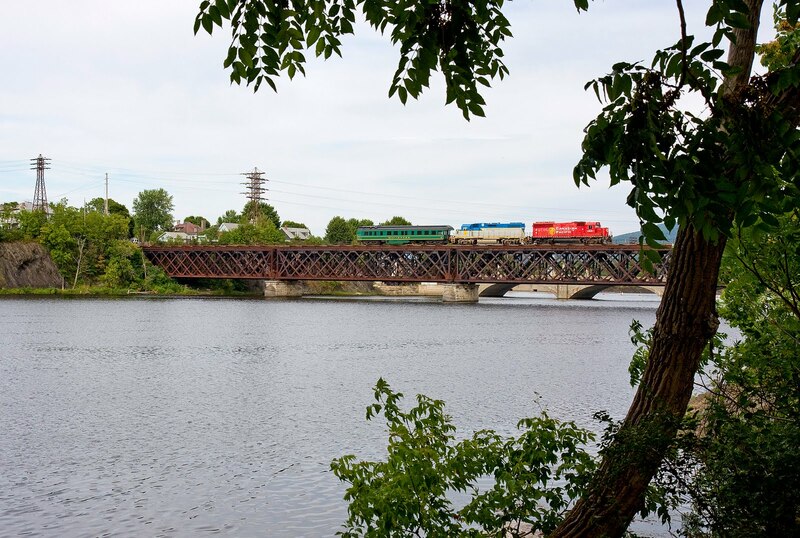 The train is seen crossing the Mohawk River between Waterford and Cohoes as it returns back to Kenwood Yard. 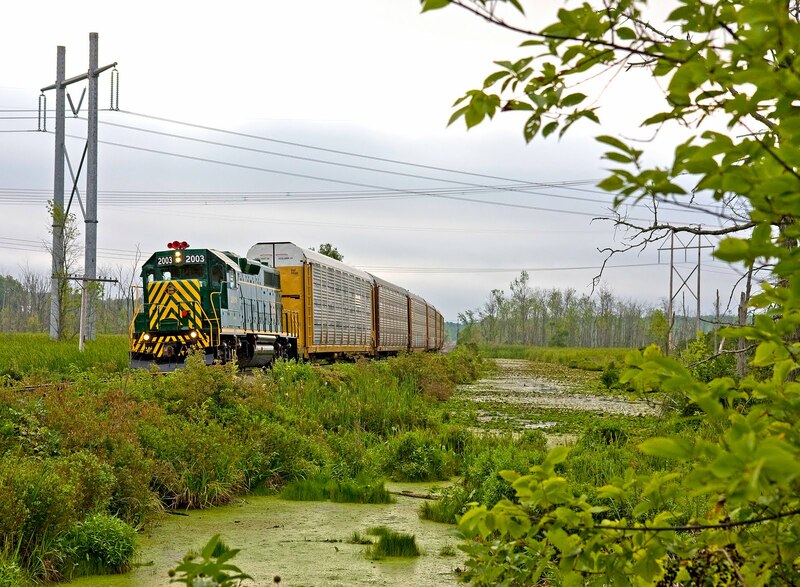 While waiting for the D&H/CP Rail to produce the encore performance to train 666s appearance here at West Chazy, it became apparent I had lots of time to consider other options regarding the view. 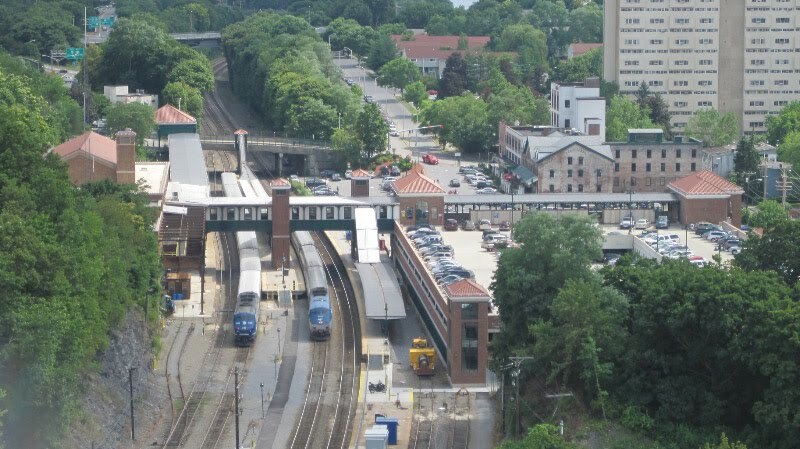 So I moved back and included less of the station and more of the train this time, while staying with the 100mm angle. Almost two hours after 666 passed by the scanner came to life with the night dispatcher giving 930 the light to proceed south out of Rouses Point. Basking in the shadow of the West Chazy tower, the scanner picks up everything going out over the air on 161.100. The attractive BNSF power, found everywhere out west, is a rare sight for us to see up along the Canadian border in New York. Thirty minutes or more after departing from Hayford Road up in Rouses Point, train 930 enables the D&H and CP Rail to come alive again before my camera in West Chazy! Given all this time to consider changing views for this shot, in my cleverness, I almost messed up by looking into the headlights too directly! The Zeiss 100mm macro lens handles the headlights admirably though, whew! What a lens to compliment a great paint scheme. What an encore! 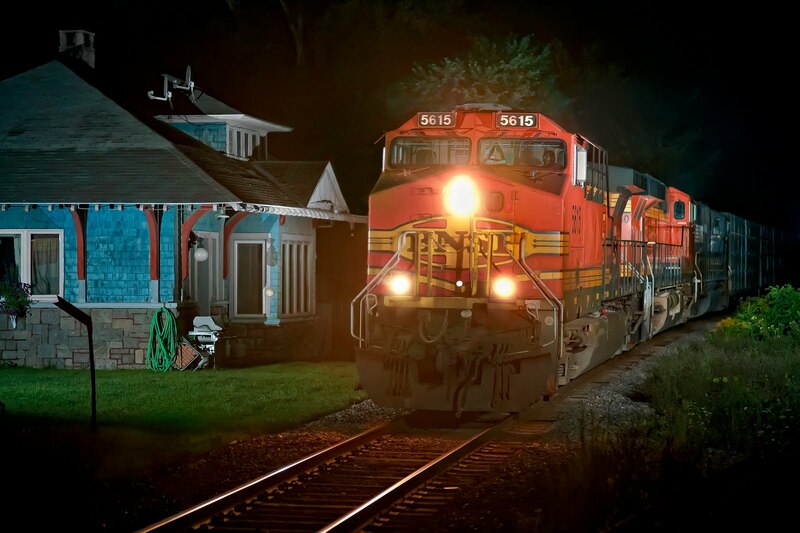 Shot at West Chazy, NY on August 15, 2010 at 02:10 with the 5D and Zeiss ZF 100/2 (Nikon) lens set at f2. 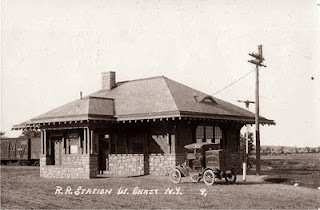 Thought you would enjoy seeing West Chazy Station earlier in its life. The postcard view looks the other way from my recent photos, but what a difference in the landscape! The attached photos are courtesy of Larry Marnes, thanks Larry! Please enjoy!